It was truly a sight to see on January 1! 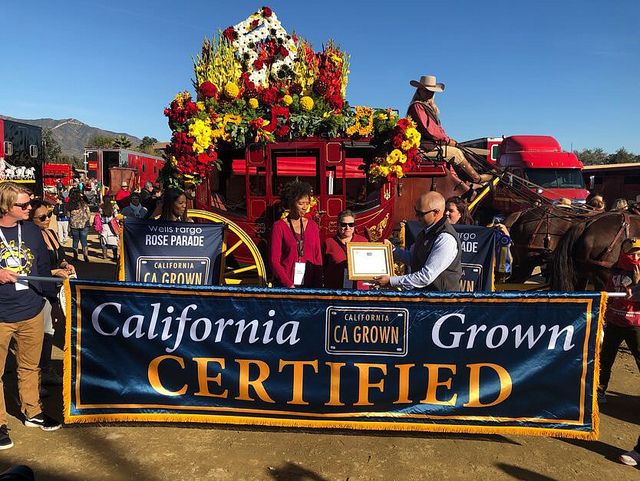 And it was a full-circle moment for the event that was originally created to showcase the bounty of what’s growing in California when much of the country is snowbound. 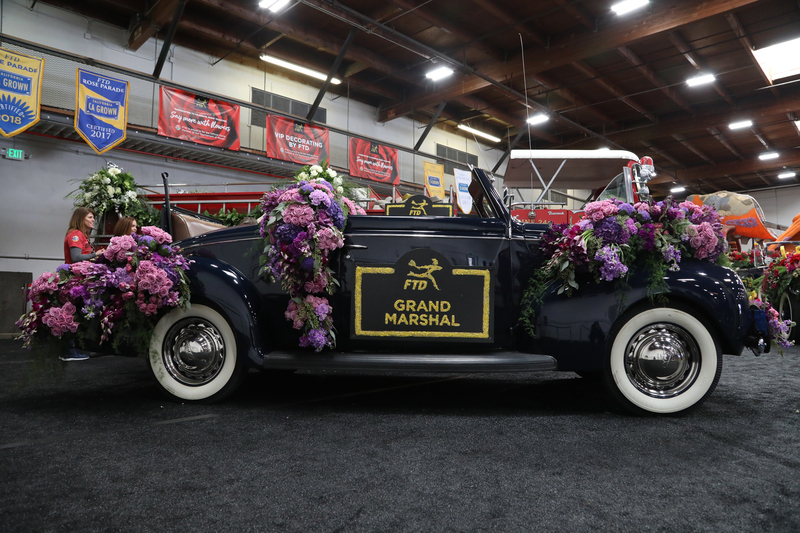 The eight VIP parade vehicles from FTD, including vehicles for the grand marshal, president, hall of fame, mayor and four Honda vehicles, featured California Grown flowers and foliage such as eucalyptus, ruscus, sprengi, stock, roses, tulips and protea. 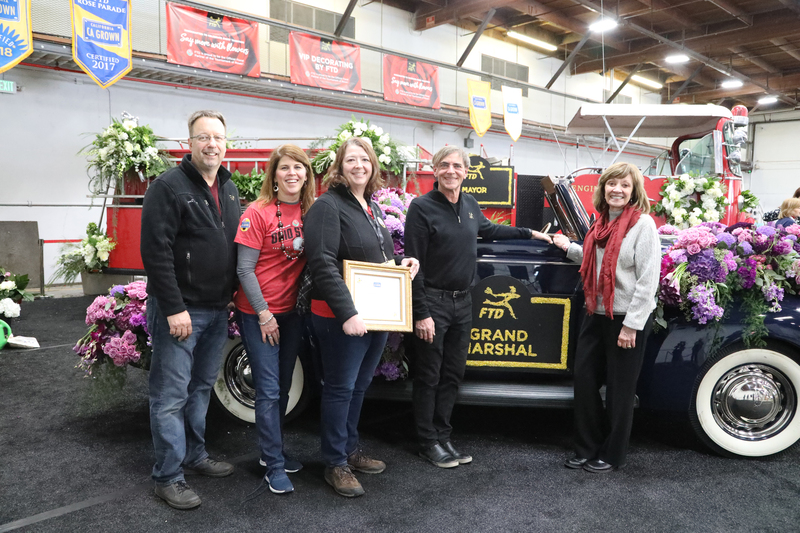 CA Grown Certification Banners hang proudly behind the floral-covered fire engine. Photo by Linda Blue Photography. 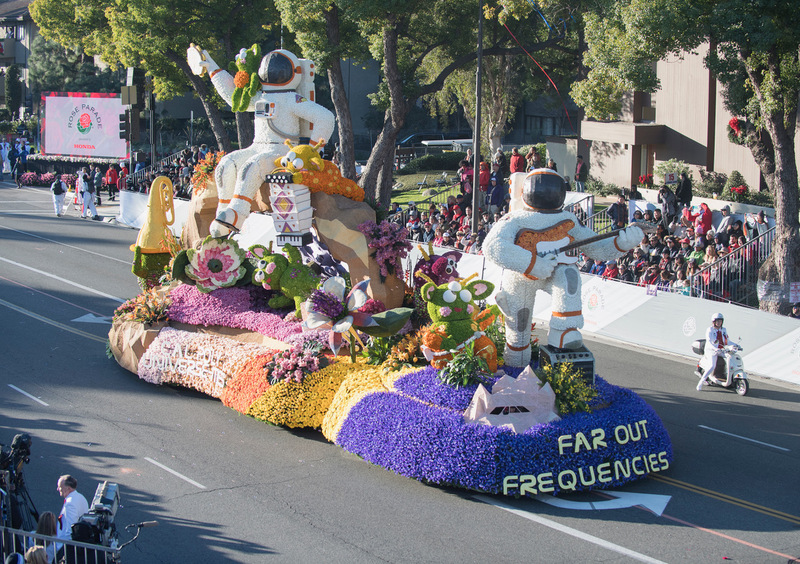 The float from Cal Poly Universities earned the Extraordinaire Award that recognizes the most extraordinary entry in the entire parade. 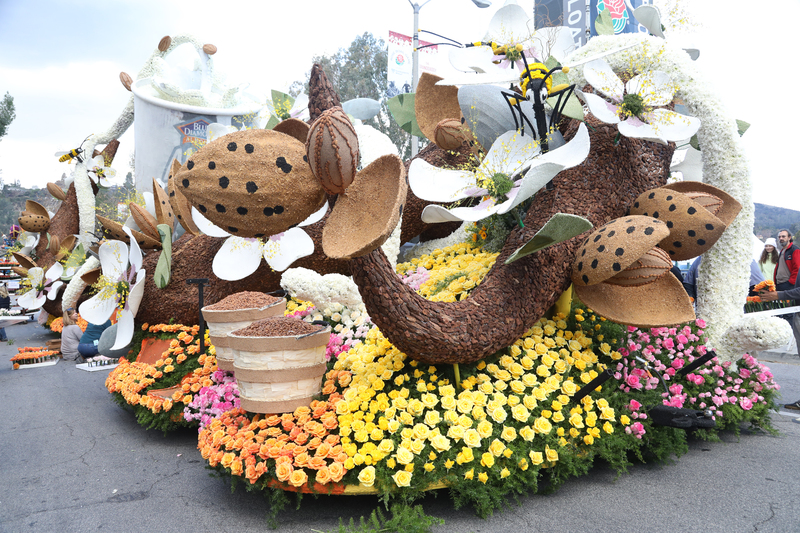 The float, designed, constructed and decorated by students from California Polytechnic State University, San Luis Obispo and California Polytechnic State University, Pomona, included nearly 91 percent of cut flower and plant materials from California. 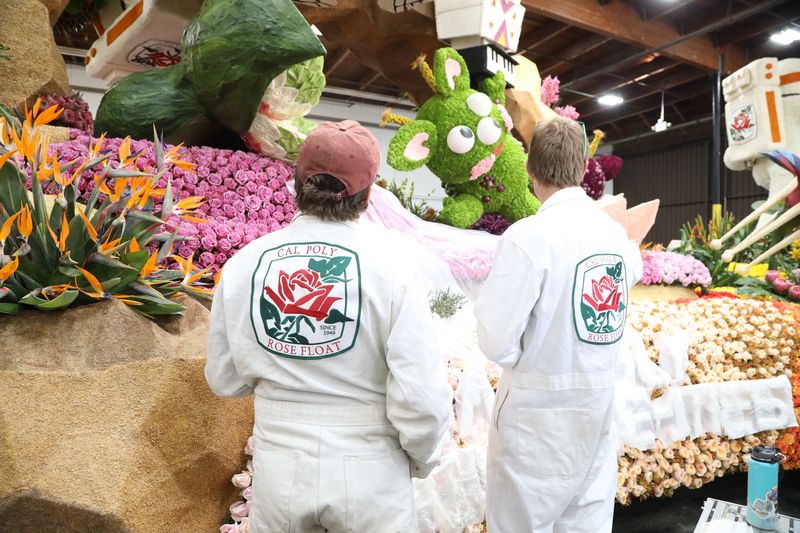 This year’s Cal Poly float was over 91 percent California Grown. 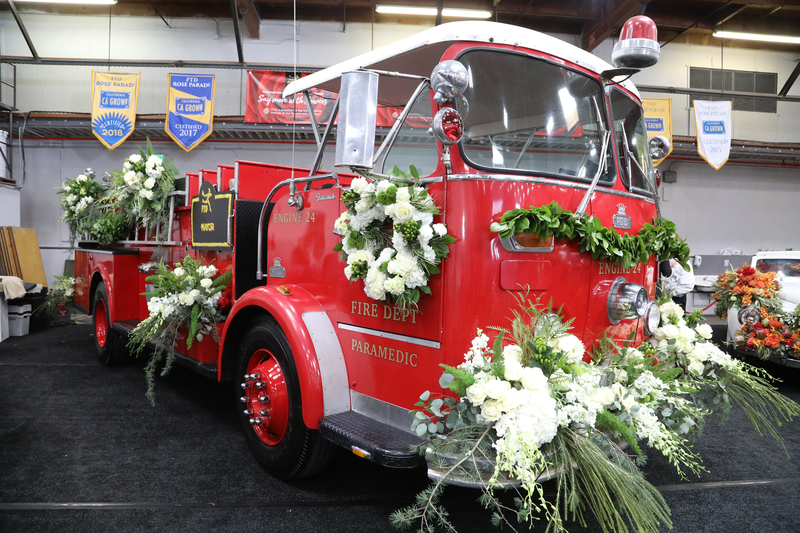 California’s flower farmers have had a longstanding tradition of donating their flowers to support for Cal Poly’s efforts in Pasadena. Photo by Linda Blue Photography. Bubbles stream from the saxophone. Cal Poly’s students take great pride in the animation efforts on their float each year. Photo by Linda Blue Photography. And the variety of blooms, all donated by California flower farmers, was truly amazing! Think chrysanthemums, roses, gerberas, iris, protea, orchids, kale, gladiolus, green trick, craspedia, birds of paradise, banksia, bells of Ireland, luecadendron, grevilia, aspidastra leaves, ruscus and succulents, along with dried marigold, strawflower, statice, delphinium and bromeliad, dracena and vriesea plants. 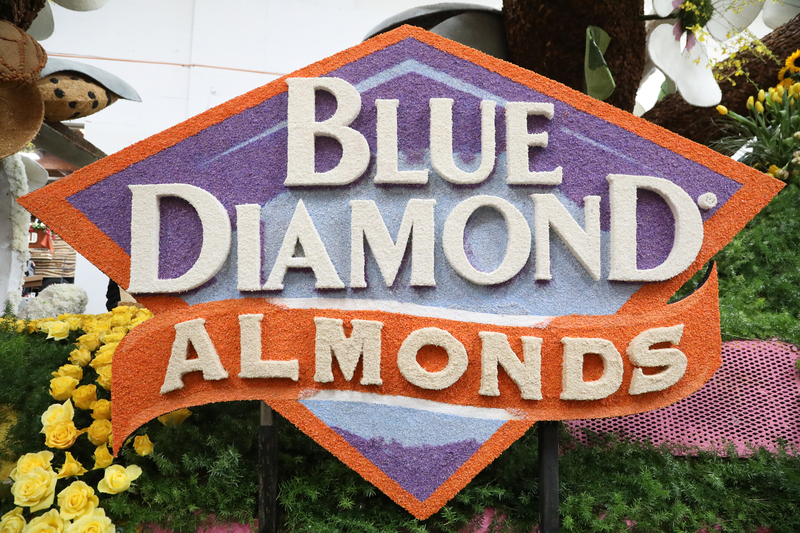 Blue Diamond participated in this year’s Tournament of Roses and committed to being California Grown. Photo by Linda Blue Photography. 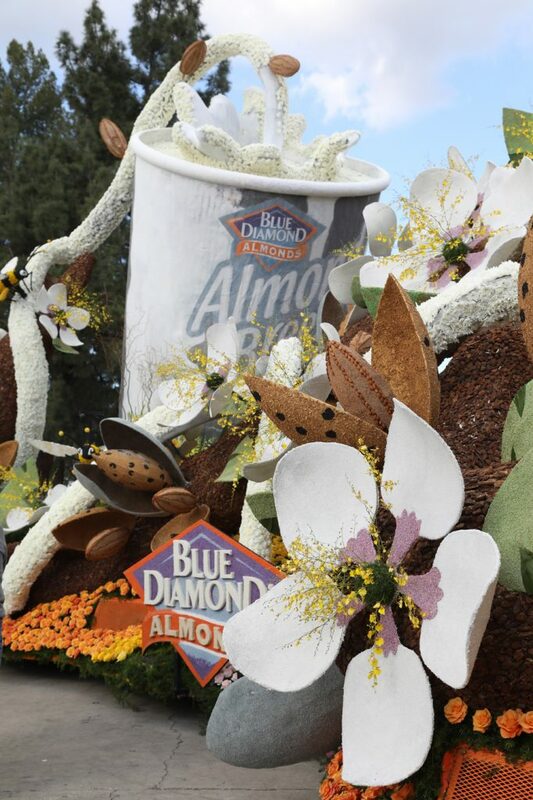 The entry from Blue Diamond showcased a deck of yellow, orange and pink California Grown roses, while the simulated bark on the almond trees featured on the float was created from real almond tree bark. Many of the entry’s other almond details were made of ground almond husks, bark and almond shells. 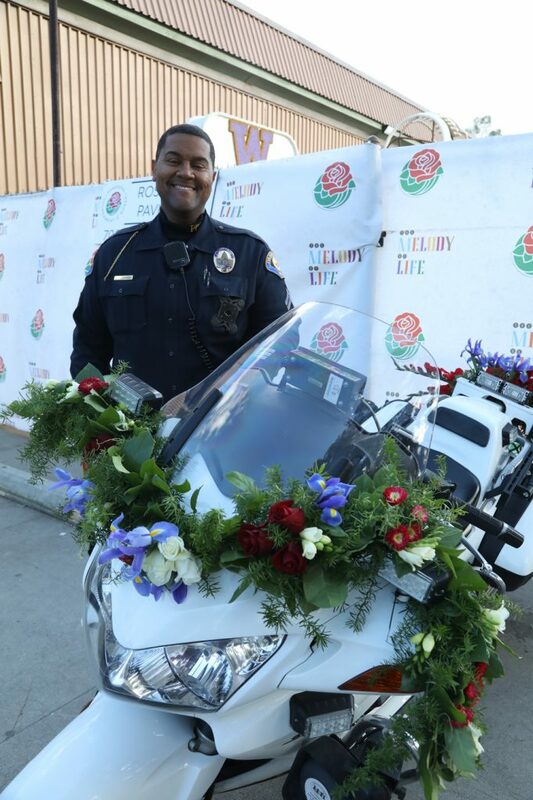 Leading off the entire parade was the Tournament of Roses Pasadena Police Department’s motorcycle unit featuring white and red roses, freesias, sprengi, salal, Matsumoto asters, irises, callas and gladiolus. 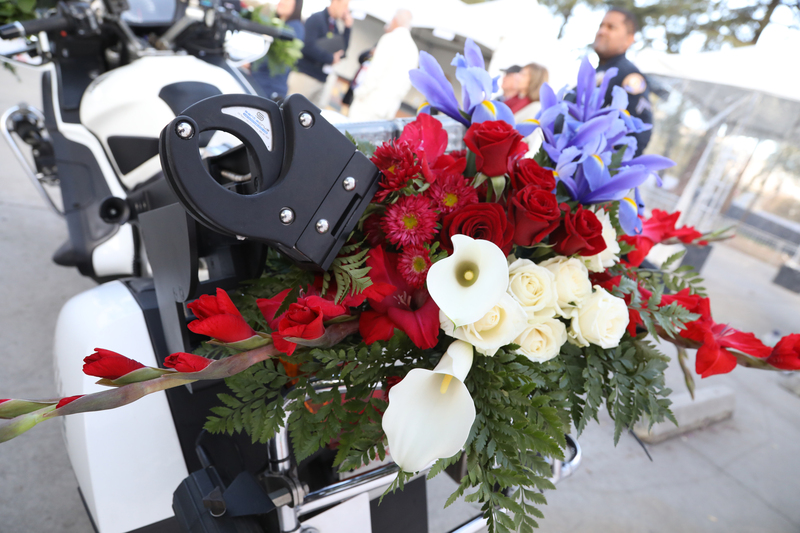 The flowers were arranged into a garland on the motorcycles’ handlebars and the back of each cycle featured a spectacular arrangement. Sgt. Locklin with the Pasadena Police Department. 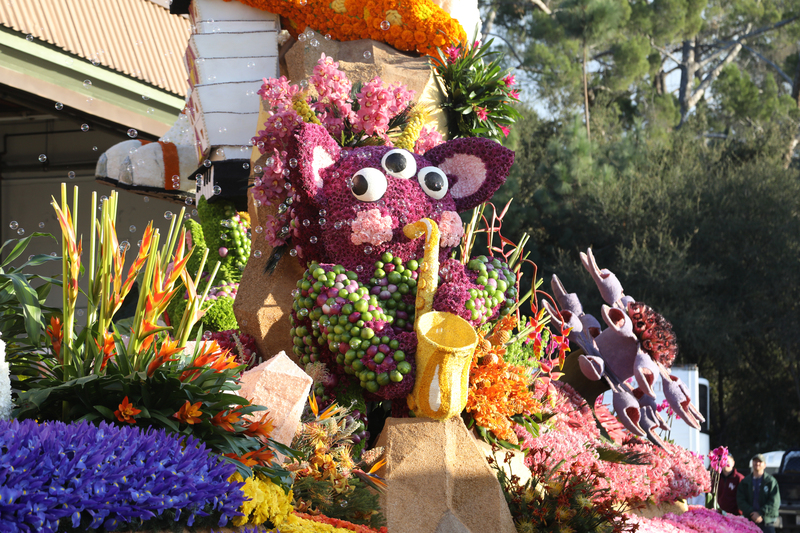 All California Grown Flowers were used to adorn the eight motorcycles used in the parade. 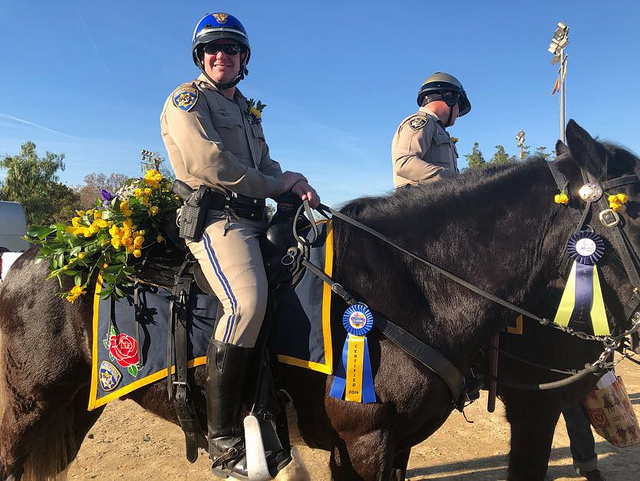 The California Highway Patrol entry that featured officers on horseback put callas, gladiolus, spray roses, iris, matricaria, ruscus and freesia in shades of purple, yellow and white front and center. The University of Washington Huskies team float featured sperengi and purple irises in a nod to the team’s colors. 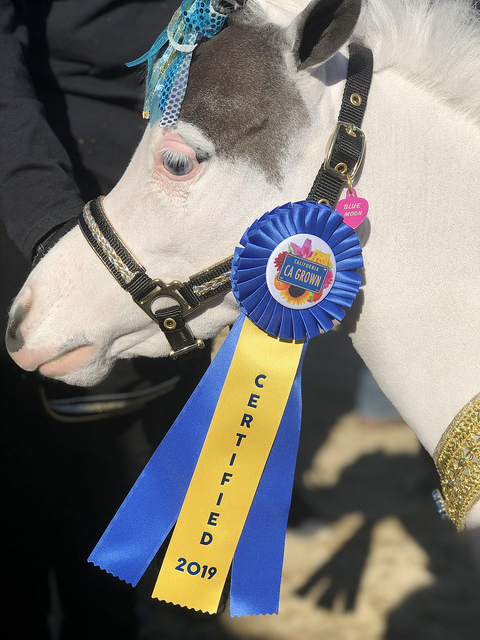 The entry from Mini Therapy Horses included spray roses, mrytle and genestra arranged as flower crowns on the tiny horses. 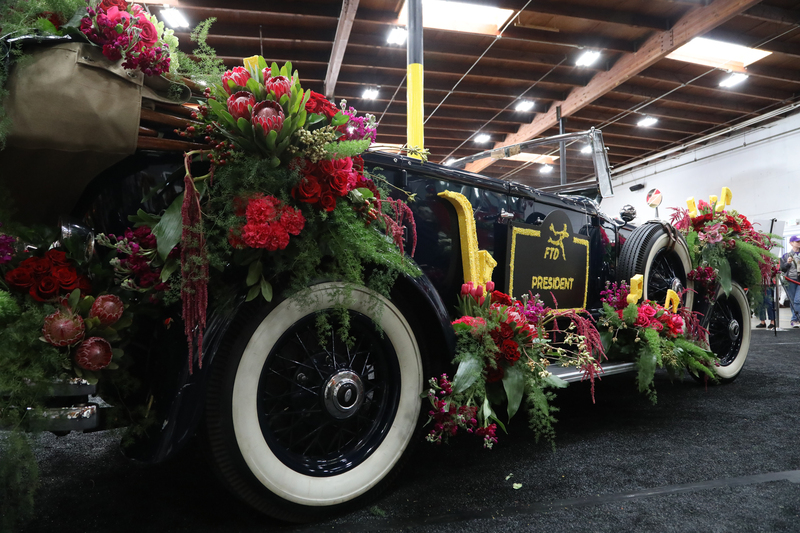 The Wells Fargo stagecoach showcased gladiolus, callas, tulips, gerberas, roses, salal, eucalyptus, solidago, sunflowers and alstromeria in vivid shades of red, burgundy and yellow, accented with white blooms and green foliage. 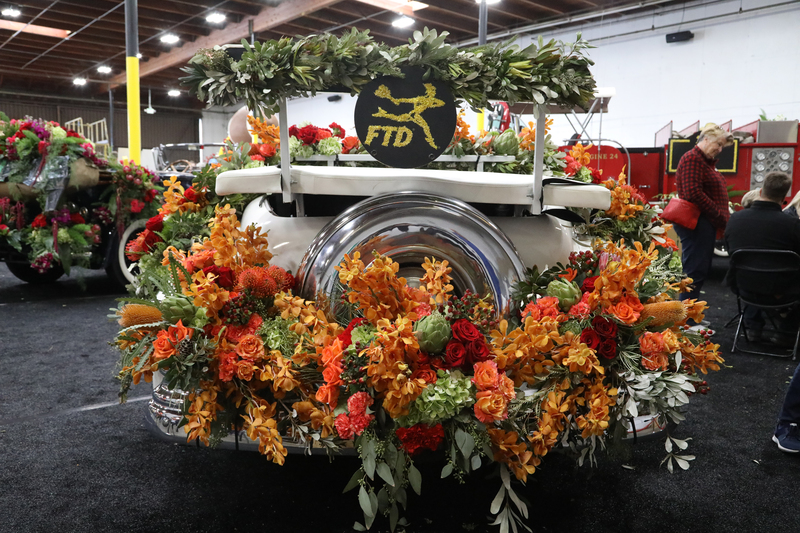 For this entry, flowers were used in arrangements atop the stagecoach, in an enormous wreath and to create a WF monogram. 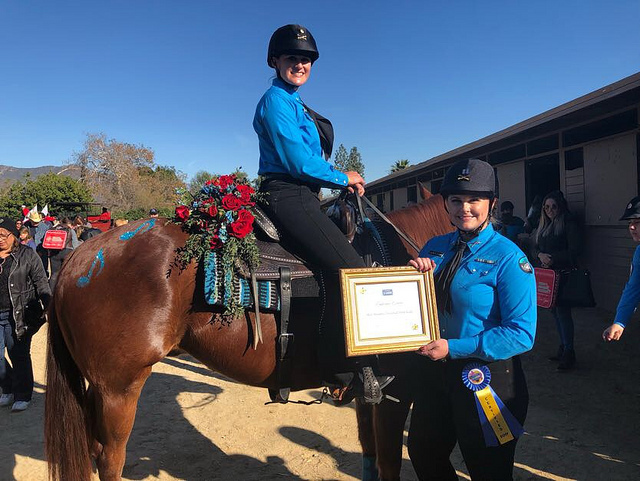 Finally, the Blue Shadows Mounted Drill Team, another equestrian entry, adorned the horses’ saddles with red roses, veronica and baby eucalyptus. 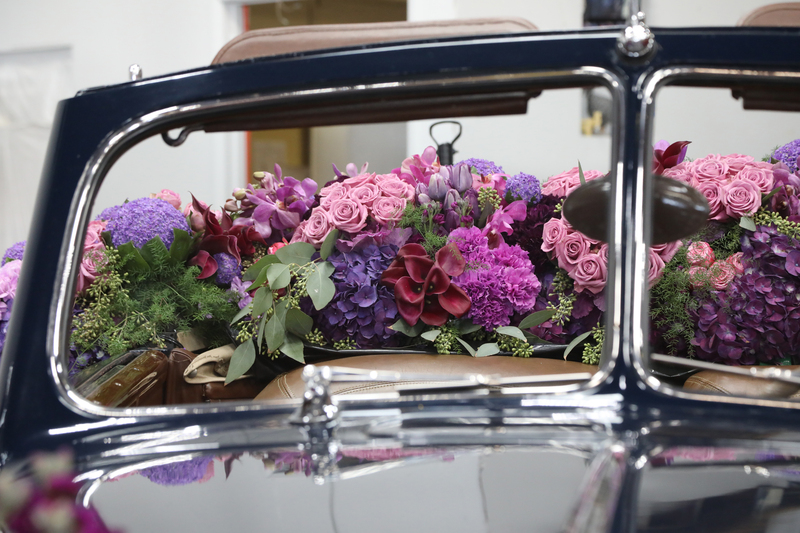 All in all, it was a breathtaking display of California’s flower bounty!